Join NYCYPAA, ESCYPAA, Jersey Committee for EACYPAA, and Boston Bid for ICYPAA for an AMAZING day of events and unity on JULY 14th in New York City! 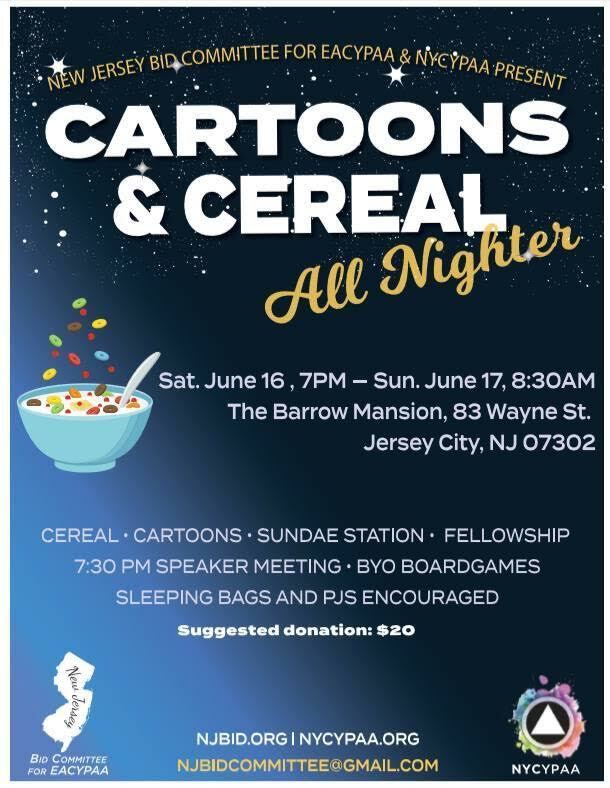 Join NYCYPAA and other New York State committees as we kick off an awesome party and lock-in at the illustrious Castle on the Delaware in Walton, NY! If you wish to sleep at the castle, please select the Sleepover ticket option. There is a limit of 50 sleepover spots. General Admission tickets do not include guaranteed sleeping space. An unforgettable weekend of campfires, fellowship, meetings, food and more. Easily accessible from NYC via the Metro North. Train from NYC: take the Hudson Line Metro North to Croton-on-Hudson. Walk north on Veterans Plaza and take a left on Croton Point Avenue. Follow Croton Point Avenue for approximately one mile, and you're there! Look for the NYCYPAA signage or balloons for the check-in station. NYCYPAA is back and stronger than ever! Every year, NYCYPAA has served up some spooky beats with DJs from our local area. This year is no different, well maybe, kinda! Get into the Halloween spirit with DJ Tom C. AKA "Dirty Chime", and special guest Jared M, better known as DJ "DB Cooper," from the sunshine state! You read that right- our friends from the South will be ripping it up with us this year! For those of you who missed EACYPAA back in February, or just didn't get enough. This is the same lineup from those insane dances! A mix of progressive EDM and Trap, we will have everything to shake up your soul! (Oct 28th to 30th)!! There's no better way to get excited for our state conference than surviving "The Doctor's Nightmare" with your friends! Doors open at 9pm with beats melting your face until 2am. Online registration for the boat party has ended. Tickets are available for purchase in person at the New York Hilton Midtown until 5:00 pm today. BOAT LOADS AT 7PM SHARP!!!! WE WILL NOT WAIT FOR YOU!! The FellowSHIP Boat Cruise requires pre-admission to board. No tickets will be sold at the dock or on the boat. Tickets are only being sold online- You MUST buy tickets before you get to the dock. You can check in with your name or wristband. Tickets are electronic and do not need to be printed. Simply check-in with a NYCYPAA volunteer to board the boat. EXPRESS WRISTBAND BOAT CHECK-IN: If you already registered, please come to registration at the Hilton (1335 6th Ave @ 54th, 2nd Flr.) between 1pm and 4pm to check in and get a wristband. This will save time when boarding the boat. Registration for the weekend. Includes five lovingly-cooked meals!